Thanks a lot for viewing the first video ...That was very encouraging. Well, in today's video" Fascia Research Congress 3 -- Field Report of DAY 1" there is way more content -- there were a number of very important presentations and although I tried being brief -- the total overview still run into 28 minutes. However, every individual "eureka" realization is short enough (1-3 min) -- so I hope you'd find it well watchable. I am trying to step into the shoes of a real blogger -- the one with the instant upadates and the news report. Me, Mark and Sarah are in Vancouver at the Fascia Research Congress # 3. Busy time here. So here is the short video that gives you a basic feel of how things are. I tried my hand in editing -- the result is rather amateurish but I hope that will suffice. Stay in touch and vist daily! This post continues our explorations into the matters of hip subluxation in Cerebral Palsy. I labeled it as Part 7 – but it might have as well been "The Part 1" since it addresses the issues that puzzle you the most. "How will the leg bone get in if the "pelvic roof" is flat? " … In more appropriate terms it sounds: "How does the femur head find stability under the flattened acetabulum of the pelvis in cases of severe quadriplegic Cerebral Palsy?" – these are the questions that I receive probably most often. In this video I give the entire context and reference the development of the pelvis in a healthy child through the transitional phases that it goes through. The key message is straightforward – "it's not about the roof – it's about the wedging of the pelvic width by the triangle of sacrum". In this video you are going to find really clear illustrations on how it all works. As always, I invite you to ask questions , leave comments and click likes to share with your friends. Don't hesitate – speak out! Was it helpful? Have I managed to ease your worries? What image did you have in your "mind's eye" before and has it changed after watching this video? I am very grateful to a mother of this boy who sent me her elaborate questions and encouraged the making of this video as well as agreeing to share it with the other parents-- probably she's going to appreciate your feedback as well. One Giant Leap: The Science of Physical RehabilitationA blog dedicated to present, discuss, and debate scientific concepts in the field of physical rehabilitation, structural integration, and high performance training. It has been quite awhile since the posting of part 1 and part 2, however there has been a recent ¨spike¨ in reads for both parts (currently rank #2 and #9 in the top 10 reads) therefore I think it is an appropriate time to complete the trilogy. As per part 1 and 2, a radical alteration of conceptual understanding of joints must take place in order to fully grasp (and appreciate) the complexity of human movement. I read a book called The Structure of Scientific Revolutions that effectively demonstrates a ¨fatal¨ flaw in the evolution of science...most (if not all) of the new ¨scientific discoveries¨ are derived from already established paradigms. To be specific, research into human movement and (bio)mechanics assumes that the traditional mathematical model (single pivotal movement) is the ¨law¨...therefore every hypothesis, design, conclusion is derived from this ¨fact¨. Common sense dictates that, if the overriding paradigm is flawed (or otherwise over-simplified), then the results / conclusions will also be so. Although over-simplification has some merit in making treatment protocols easier to ¨digest¨and conform to current health care delivery methods, it does not mean than more precise and effective understanding should be ignored. In fact, deeper understanding does not disregard the current formula...rather it ABSORBS IT. In order to fully appreciate part 3, I suggest a read (or re-read) of parts 1 and 2. However, to summarize the main message: The true definition of a joint must be expanded into a broader understanding that it is the linear or angular displacement between separate biological elements. Therefore, simple pivotal movement is only a fraction of the equation. There are 2 fundamental realities that also exist alongside of the classical mathematical model: 1) Fascial Articulations: This term defines the very real movement potential between the individual fascial layers that exist from the surface of the skin to the periosteum of the bone (and indeed even deeper into the very cell itself). The above image illustrates an example of the fascial relationship between muscle/tendon and adjacent structures. Effective movement requires, not only proper ¨connective¨ elements, but selective ¨DISCONNECTIVE¨ properties. In other words, the ¨sliding¨ (hence articulation) of fascial layers between each other is essential. By definition, this constitutes a joint...without these characteristics, movement potential is significantly altered leading to movement dysfunction, irregualr load bearing and stress distribution, and ultimately deterioration. 2) Movement is more precisely ¨Gear-like¨: This is perhaps confusing and counter-intuitive, however it is none-the-less a reality. The pivotal model suggests that movement is a summation of single pivots moving at the same time. Once again, this is a serious over-simplification. True function is achieved through a complex of gear-like movements that are NOT the sum of individual movements rather a single unified systemic response. The image to the left clearly illustrates that single pivotal movement (hip joint) is effectively a small contributor to the performance of a straight leg raise (hip flexion). This movement is defined by gear-like movement between the individual vertebrae of the lumbar spine, the pelvis, and the hip. In addition, this requires proper fascial articulation (sliding) of the fascial layers of the posterior leg. It is precisely these realities that highlight some of the current flaws in assessment and evaluation protocols. The fundamental question remmains: how can an effective treatment protocol be formulated when only one third of the mechanism is observed and identified??! At best, these types of approaches will be successful only 33% of the time and/or resolve only 33% of the initial problem. The concept of re-defining the definition of a joint only serves to enhance understanding and by default result in more effective interventions. The switch from pivotal understanding to the ¨gear ratio¨ perspective will provide some valuable insight and clarity into the amazing movement potential of the human body. I am reminded of an ¨Old School¨ kids game called Spirograph. My brother and I played with this quite alot, but it has its merits from a conceptual perspective. 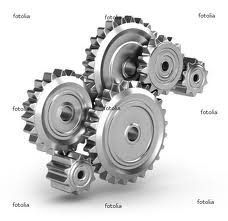 It involved placing variuos small gear-like tools into the center of a larger circle with gear teeth. You would then insert pencils of different colour into the smaller gear and spin it around the outer circle. The result was a myriad of amazing shapes and images. Although it is a simplistic analogy, it reveals the sophistication and complexity that exists in this model...whch is reflected in the everyday marvel of human movement. I hope this trilogy has been both informative and insightful. If nothing else, it serves as an example of the need to reach beyond current accepted paradigms in an effort to evolve your understanding. Cheers.